With fellow mourners helping his sister to stand, the body of defrocked priest John J. Geoghan was laid to rest yesterday at Holyhood Cemetery in Brookline yesterday, under sun-filled skies and the careful gaze of a police officer outside the gates. Dressed in a black suit, Catherine T. Geoghan stood before the mahogany casket, surrounded by about three dozen friends and clergy members, including several nuns in bright white habits. A large bouquet of flowers sat atop the coffin, as did a piece of Geoghan's old priest garb. 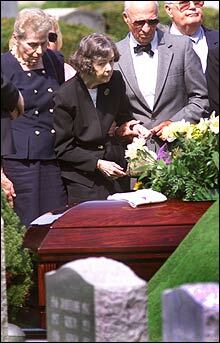 The burial rite lasted about 15 minutes, and mourners comforted Geoghan's sister before quietly leaving. Minutes earlier, four pallbearers quickly descended the stone steps of Holy Name Church in West Roxbury, carrying Geoghan's body after an hourlong, private funeral. At the same moment, Catherine Geoghan -- flanked by about six mourners, two of whom held her arms -- walked slowly out a side door of the massive church. The funeral procession of fewer than 10 cars then drove to the Brookline cemetery that is the burial site of several members of the Kennedy clan, including President John F. Kennedy's parents, Joseph P. and Rose Fitzgerald Kennedy. Four Boston mayors, a cardinal, and several bishops also are buried there.Geoghan was buried six days after he was slain in the protective custody unit at Souza-Baranowski Correctional Center. Authorities say a fellow inmate, Joseph L. Druce, 37, bound and strangled the former priest. Geoghan, 68, was serving six years of a nine- to 10-year sentence for fondling a boy at a public swimming pool a decade ago. He has been accused of molesting about 150 children, mostly boys. Since Geoghan's death, his lawyers have detailed harassment they say the former priest was subjected to by inmates and guards while incarcerated at MCI-Concord, before he was moved to Souza-Baranowski. They also have questioned why Geoghan was in a unit with Druce, a neo-Nazi who was in prison for murder. One of the lawyers said that, the day before the murder, Geoghan told another inmate Druce was after him. Yesterday, two editorials in The Pilot, the official newspaper of the Boston Archdiocese, commented on the slaying and denounced a recently filed bill in the Legislature that would reintroduce the death penalty for convicted murderers who kill in prison. "Let us not compound a tragedy with another tragedy," the editorial says. "The death penalty has no place in Massachusetts." A longer editorial calls Geoghan the "victim of a hate crime," and concludes: "We encourage our readers to pray for his soul, for the his alleged killer, for his victims, and for the faithful priests who suffer, daily, the consequences of the actions of a few." Michael Rosenwald of Globe staff contributed to this report. C. Kalimah Redd can be reached at kredd@globe.com.